What is CT's worst flaw? Chrono Trigger is a game often not described as being flawed; its nearly perfect execution and design give it a shine that garners only praise. With any case of extremes, I thought it would be interesting to find out what fans feel is the signature flaw of the game, and explore their responses. I set up a poll on a few forums; the results were scant, mostly due to the multitude of Chrono forums' being dead, but enough votes were cast to obtain a representative sample of online Chrono Trigger fans. 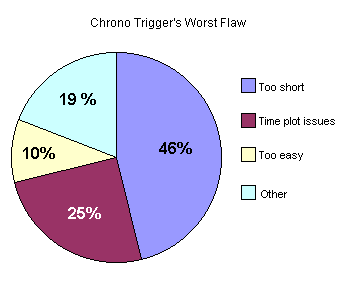 With this information in tow, let's take a look at what few flaws Chrono Trigger suffers, and postulate how they could be improved. This will be an understandably short feature, though it is unique among the milieu of interviews in the features section. Let's get it on! Firstly, let's examine the poll results. This pie chart will detail the share each option received in the polls. We did something similar with a Chrono Trigger: Resurrection poll. 52 people responded. This prevailed as the most common beef fans have with the game. Chrono Trigger takes roughly 20 to 30 hours to complete, versus 100 in some SNES / SFC RPGs (such as Dragon Quest VI). The best speed run for the game clocks in at 4 hours and 56 minutes. For a world as rich and engaging as Chrono Trigger's, this is somewhat of a letdown. Reasons for identifying the brevity as the keystone flaw vary; one criticism is that Chrono Trigger contains a restrictive HP / MP limit, capping out at 999 / 99 respectively. This could limit the scope of the game, as segregating different levels of difficulty is harder with a smaller range of points. Another jab comes with criticism of the prehistoric era, seen as underdeveloped and underutilized. This may be due in part to the elimination of Singing Mountain, a prehistoric dungeon that was ruled to be unimportant to the plot (though it should be noted that the mountain was replaced with the Black Omen in the game's code). 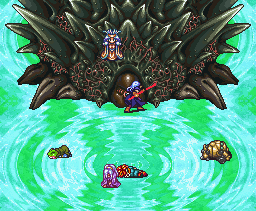 Additionally, unlike each of the other characters (possibly excluding Crono), Ayla received no sidequest. During "The Fated Hour", Ayla's era was only mentioned as a place to buy fire resistant armor. Ultimately, Chrono Trigger fans want more mileage from the game. If a Chrono Trigger ROM hack were to remedy this, it could do so by putting Singing Mountain, Zeal Dungeon, and the Sealed Pyramid treasure dungeon back in the game, as well as giving Ayla a sidequest. Since most of the location addresses are used, however, it would take more than a rudimentary understanding of Temporal Flux ot accomplish. Singing Mountain and a new take on Zeal Dungeon do appear in the rom hack Chrono Trigger: Crimson Echoes. For example, in Chrono Trigger, Mr. Yuji Horii wrote the basic plot line first; following that, it was editted and rewritten by me, and even further on after that, the sub-scenarios were created by Mr. Tokita and Mr. Kitase. So it all gets kinda' mixed up at the end. But the 12,000 B.C. part was 100% my original idea. After writing the story for this part, I also did the events for Zeal Palace, the dungeons, and everything else by myself (laughs)..."Trigger" wasn't exactly "smooth sailing", and a lot of the parts ended up being changed in the end. To summarize, Yuji Horii made the lighthearted story of adventurers going through time, and also set up the events to propel the plot in motion (Marle's disappearance). However, it fell on the other scenarists and Masato Kato to fully flesh out the game's mechanics. As it all panned out, the original requirements came to conflict with the internal logic that evolved from the series' mythos. Nonetheless, no one in the poll reported that his or her enjoyment with the game was seriously impaired by the problems. As Basil Exhibition noted in the second Austin Powers movie, "I suggest you don't worry about those things and just enjoy yourself." Chrono Trigger fans did exactly that. If the game were to be improved by rom hacking, explanatory loop holes could be inserted in the text (and additionally, the Marle disappearance can be rationally attributed to the Entity). The last major complaint with Chrono Trigger is that it is too easy. This problem is twofold. Firstly, the Chrono series is unique in that a fair share of monster battles can be avoided by simply not making contact with patrolling enemies. This cuts down on the number of battles that must be fought. Secondly, the game's actual difficulty is generous; as it takes 20-30 hours to complete, a little leveling up can go a long way, and Lavos can be defeated as low as level 40 (even lower with techniques spelled out in Low Level Guides). There was also no insanely difficult optional boss (akin to the WEAPONs from Final Fantasy) to provide impetus for reaching level **. Unlike the other flaws, this one has already been addressed by rom hacks. The first of note is the Chrono Trigger Hardtype, which makes the experience rougher and requires significantly more leveling up. Second is the Level Zero hack, which seeks to make the combat more balanced. Finally, the Chrono Trigger Coliseum seamlessly adds a new venue of combat to Chrono Trigger, and features some very difficult battles on the highest difficult. Try beating it solo to see the Cyan cameo! Other flaws were mentioned in the poll by way of its last option. They included a criticism of the battle system for not developing area combat enough and a jab at the inability to rearrange characters during combat and use front or reserve positions. But to conclude, Chrono Trigger is hardly a deeply flawed game. These minor notes are merely roadbumps on the road of enjoyment traveled by its players. Chrono Trigger's quality is of the caliber expected of a game that starts a full franchise series. Chrono Cross, despite a significant flaw in pacing, held up that tradition by providing a fun and arguably deeper experience. Let's hope that the next in the series, when it comes, will uphold this legacy further. Godspeed to Masato Kato, Yasunori Mitsuda, Yasuyuki Honne, Minoru Akao, Hiroki Chiba, Kyoko Yamashita, and all the other Chrono alumni! In addition to the Compendium's forums, the polling took place on four websites (a few other Chrono forums saw the poll, but had no activity).